At Deputy, it’s important to us that you stay workplace compliant. We know it’s hard to keep up with all the new changes, but that’s where we can help. Following on from our recent article about the EOFY wage adjustments we published earlier this month, we would like to share with you more details on the specific rate changes that are coming to our custom awards library in Deputy from July 1st 2017. If you’re operating under the Hospitality Industry General Award, Restaurant Industry Award, General Retail Industry Award and Fast Food Industry Award, you’ll want to be aware of the following changes. From the 1st July there will be two versions available for the following awards: Hospitality Industry General Award, Restaurant Industry Award, General Retail Industry Award and Fast Food Industry Award. Version one (pre 1 July 2017) is an update for the existing award library to include overtime conditions (Sunday overtime and Public Holiday overtime) that weren’t previously included. Version two (post 1 July 2017) will include the same updates from version 1 while also incorporating the new penalty rate changes. At Deputy, we are committed to keeping all of our customers Fair Work compliant, as effortlessly as possible. If the Award you require isn’t currently in our system, please fill in this quick form and we will get in touch. We would love to hear your feedback about these changes, so please don’t hesitate to contact us. The post Important: Changes to Penalty Rates from 1 July appeared first on Deputy. Cin7’s integration to global eCommerce marketplace eBay went live this week. eBay, the well-known auction website launched in 1995, grew to become the second most-visited online marketplace in the US, according to Statista. eBay today connects both professional B2C businesses and B2B suppliers with 167 million active customers. With the eBay integration, Cin7 customers can extend comprehensive inventory management to yet one more eCommerce marketplace. Build new sales from a channel that attracts 96 million visitors in the US alone. And eBay connects businesses to customers around the globe. While the US represents eBay’s most active market, 56% of eBay’s revenue comes from the rest of the world. eBay’s founder sold one of the website’s first items at auction: a broken laser pointer. Ultimately, a customer bid $14.83 for the product. Thus, the auction model proved viable. Apparently, a market exists for everything and eBay accommodated sellers that let the market decide an item’s worth. Users still sell at auction today, but eBay is much more a marketplace for b2b and b2c sellers. In fact, according to the company’s 2016 financial report, something like 87% of eBay products sell at fixed price. That means serious B2C businesses use eBay to reach customers. Furthermore, B2B sales represented $4 billion of eBay’s $82 billion annual gross merchandise sales reported in 2016, making it a useful tool for B2B suppliers. A common difficulty among eCommerce companies is to maintain the right amount of stock for each of their online channels. Synchronize your eBay products and sales orders with your overall inventory. Update stock levels as you sell across all your channels. Let your eBay customers know exactly what is currently available in stock. Check out what else Cin7 can do to make your multi-channel business more efficient and more profitable. The post Cin7 Adds eBay Integration to Supply Chain App Store appeared first on Cin7. 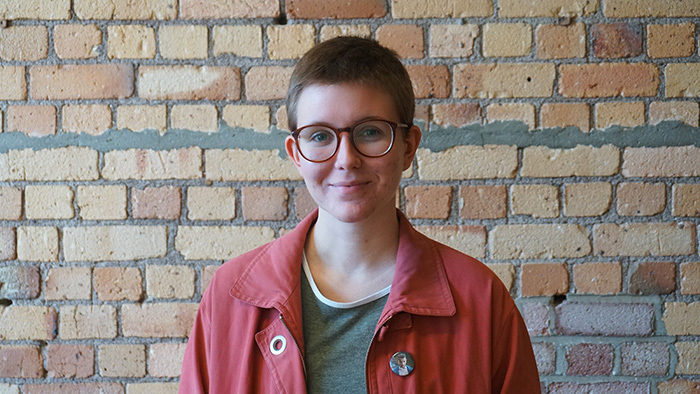 Caterina studied Digital Design for three years at AUT, graduating in December 2016. She specialised in live action camera work and VFX. Initially Catarina worked at Xero as an intern as part of work experience required for the third year of her degree. Now she is full time at Xero working in digital marketing. Assigned to making the Xero Instagram beautiful Caterina opted for changes in the Instagram strategy. She set out to interview and photograph customers to feature and advocate. 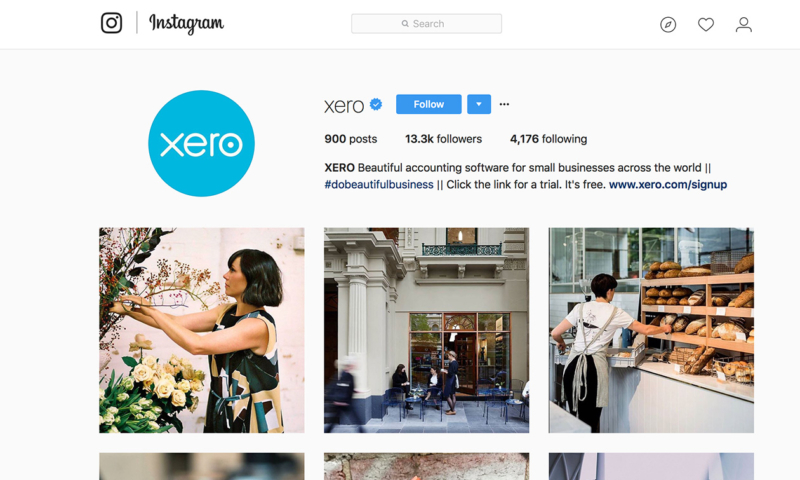 The change in Instagram tactics was to align Xero’s core values around helping small businesses thrive; through better tools, information and connections. “We also love to introduce people to new wonderful businesses and help them connect via the posts we share on our Instagram account” she says. Caterina has grown the follower count from nearly 2k to 13k. 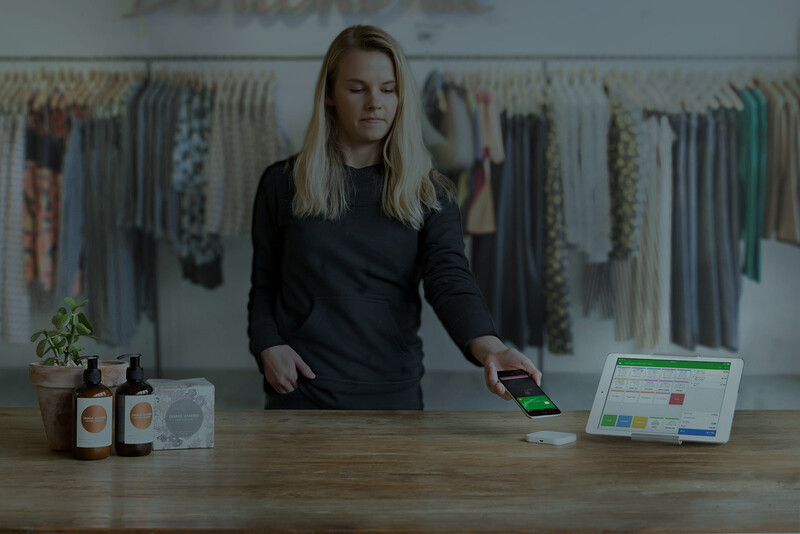 Now, Xero’s Instagram page is completely dedicated to featuring small businesses around the globe. It focuses on a range of SMB’s with different industries and backgrounds. She explains that “Instagram is a wonderful platform for visually promoting products and services. We especially love to feature businesses who rely heavily on their Instagram accounts to drive sales. SMB’s also love being promoted on our account. Lastly we get many businesses reaching out to us asking how they can be featured as well”. Engage with businesses similar to yours. Following, liking, and commenting on relevant accounts can help increase engagement for your business Instagram account. It’ll also help you appear as a recommended follow when users follow businesses similar to yours! Do some digging to find the relevant hashtags that have got large communities. Take a look at what hashtags other industry influencers and competitors are using. Also be sure not to overload your posts with hashtags because that looks spammy. Just focus on those big relevant ones! Create a branded hashtag just for your business! We use #dobeautifulbusiness on all of our posts. Other businesses will also use that hashtag if they are sharing something relevant that they might want us to share to our own account. Stories can be a great way to share what’s going on with your business in the moment. While Xero’s posts focus on small businesses, we sometimes use our story to share what’s going on in the office. For example when we hit a million subscribers! We posted stories about the celebrations in our offices around the world so that our followers could follow along. Utilise the link in your bio. Got a sale on? Pop a link to it in your bio and direct your followers to it in your post descriptions. Maintain a regular posting schedule without bombarding your followers with too many posts. This almost goes without saying, but post beautiful pictures! Well-composed photos at a high resolution typically get more engagement than lower quality snaps. Take beautiful photos that will creatively show off your products and services. Switch your Instagram to a business profile. This will enable you to review insights and analytics to better understand your audience and what kind of content they respond to the most. So be sure that you’re following @Xero on Instagram to see the next big thing we’ve got lined up for July! We’re going to be revealing a new project that we’ve been working on for months. Through it we’ll be championing our businesses and emphasising the partnership between Xero and its businesses in a way that’s never been done before! The post Profile: Caterina Atkinson, Instagram Expert appeared first on Xero Blog. Feeling Frustrated? 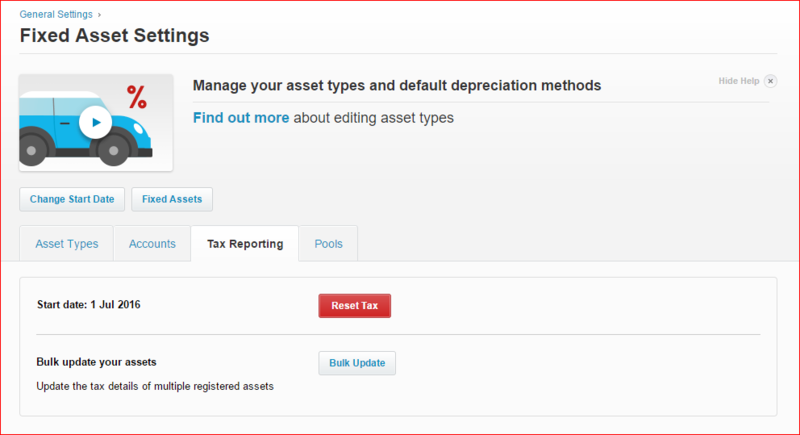 You’re using Xero’s pooling solution, but don’t like the prospect of editing assets one by one? Here’s some good news! We’ve launched the Bulk Update tool. 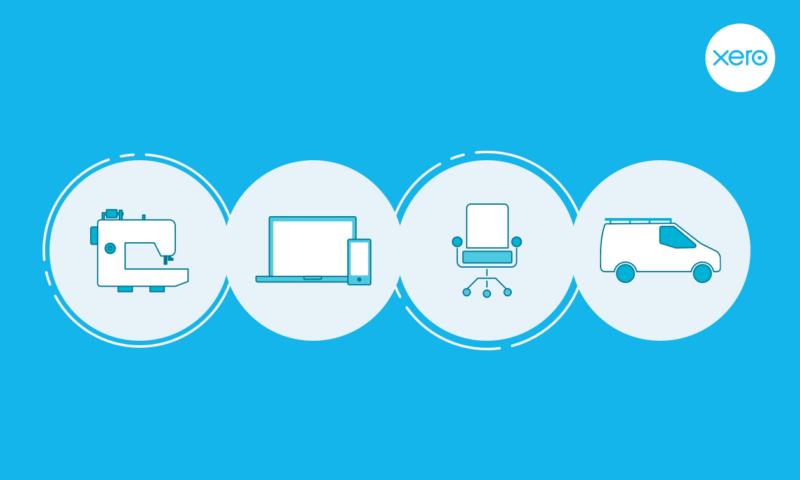 At Xero we strive to present solutions that are not only beautiful but are also efficient. If you have several assets which have to be edited, it’s inefficient and painful to update each of them. And this is precisely why we built the Bulk Update tool. Just download all your registered assets as a CSV file. Then you simply make the desired changes to your tax details and upload this file. Xero will then take over from here and update all your assets. Isn’t that simple? There’s more good news. If you have been patiently (or impatiently) waiting to use Xero’s pooling solution, I am happy to share that we are opening it to the whole of Australia. In the next few weeks, everyone will be able to use tax and pooling. We’ve listened to your feedback, have gone through your posts in Community and looked at feature requests. The next immediate work in our pipeline is the Pool Detail report. This will supplement the existing Pool Summary report and give you insights into all the transactions which have happened in a pool for a financial year. You will be able to tell when and which assets were added or transferred, the adjustments made to the pool and pooled assets which have been disposed. The report will give you a running pool balance showing the impact of each transaction on the pool. Many of you have told us that you wanted tax journals. We have added this to the list of things to build. While we in the Fixed Assets team predominantly built features for the AU market in the previous year, our focus is to now address the wider global region. There are some really exciting features we are looking at building. As you see, we have lots to do. Watch this space for more updates. As always, continue to send us your thoughts. We’re in this journey together to build a super Fixed Assets experience. The post Update your assets in bulk Australia appeared first on Xero Blog. Xerocon Melbourne 2017 is fast approaching, early-bird tickets are soon to end, and the pre-event buzz is building. But what’s the big deal and why is it so unique? And what value do other accountants and bookkeepers see in the opportunity? 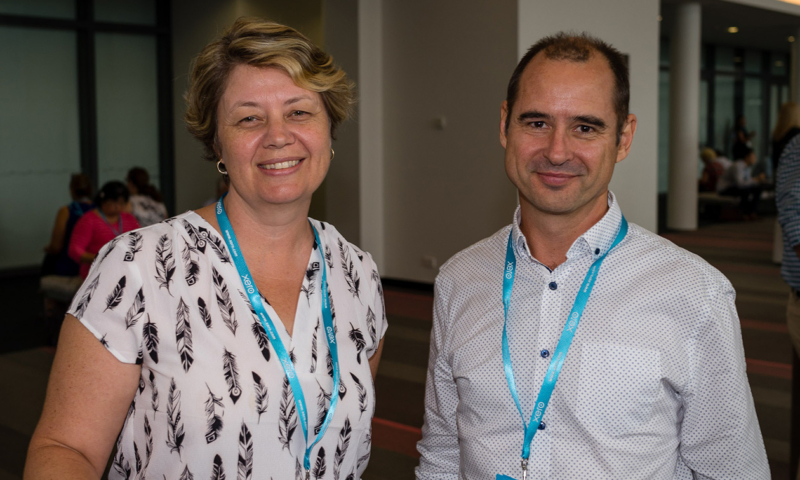 We spoke to Steve Warwick, CA, and Janet Collard, CPA, from Brisbane-based bookkeeping firm Reconciled to hear what they gained from last year’s event – and why they plan to take their whole team this year. Steve’s own blend of commercial finance skills and forward thinking has been well honed. He worked at Coopers & Lybrand (now PWC) and held senior positions in London with Deutsche Bank, ABN AMRO, and Schroders Investment Limited, before returning to Australia to cofound Reconciled. For Steve and Janet, putting in time to understand the future of their industry is a necessary part of running a successful and sustainable business. “If you think in a purely traditional sense, the way we think of bookkeepers and accountants is rapidly changing,“ says Steve. 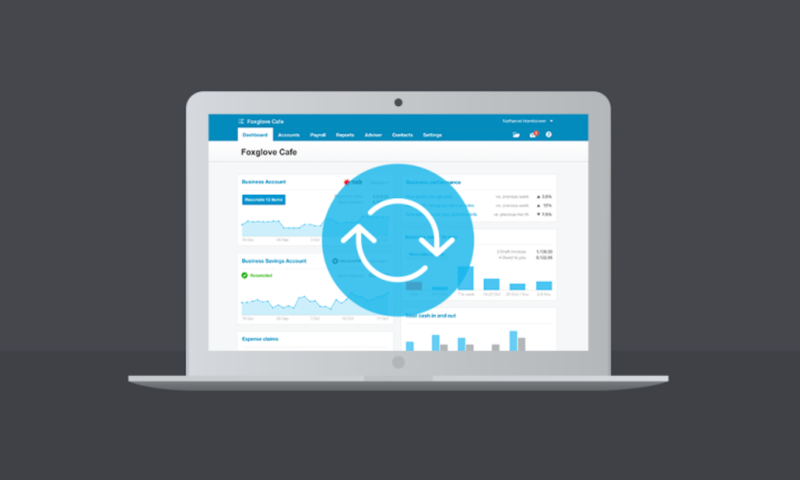 “Reconciled is a Xero-only bookkeeping practice. First and foremost we provide our clients with systematic, cloud bookkeeping services. And while cloud technology and the emergence of AI and outsourcing is disrupting traditional services, it is bringing with it new opportunities. “For both Janet and myself, it is imperative that we balance running a growing practice and ensuring that we remain contemporary and well-placed to take advantage of these new opportunities. For a company so focused on the future, a structured opportunity to hear from fellow accountants, bookkeepers, industry influencers, and thought leaders from across Australia, New Zealand and Asia is too good an opportunity to miss. 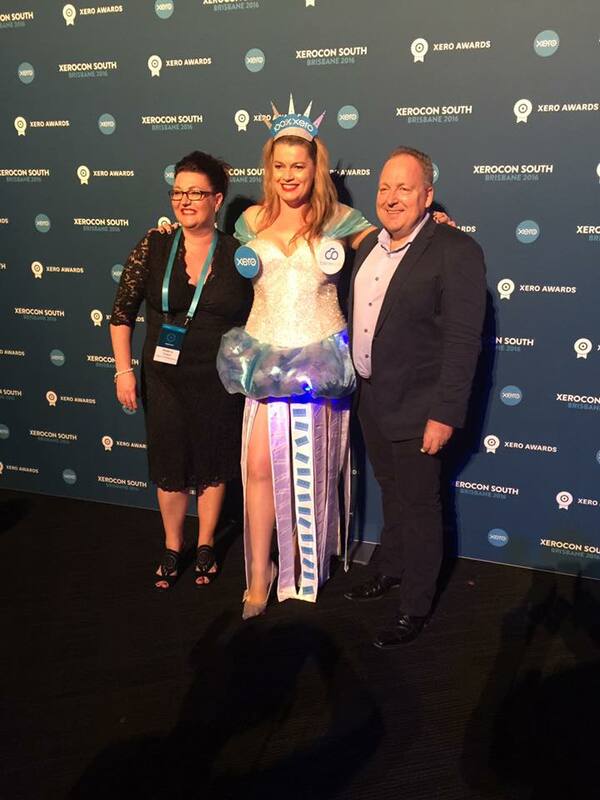 “Our industry changes became so apparent at the last Xerocon conference,” explained Janet. “There were so many different people from so many different places. They were all talking about what’s changing in the industry and how Xero is changing, too. Back at the office, Steve and Janet continually take time to think and reimagine their practice in three to five years’ time. “I think the advent of AI technology will go some way to supersede some of the manual labour, but it won’t replace expertise, process and client and advisor support,” says Janet. “It’s fun to think about, because we love the flexibility and excitement of what’s happening in the industry. The post Reconciled bookkeeping: Why we’re taking our whole firm to Xerocon Melbourne 2017 appeared first on Xero Blog. We’ve made a number of enhancements to the way we handle refund transfers on tax returns. There’s now much more flexibility. Plus, these changes will save you time and reduce the chance of sending an incorrect tax reminder. Our 2017 tax returns have a new section for Additional Transfers. The standard income tax returns from the IRD have a limited number of options for transferring refunds. With our new additional transfers section, you can add as many transferees as you wish. You can also transfer to any tax types and tax periods you want. For associated taxpayers, you can also specify the preferred “as at” date for any transfers if you want to. If any of these additional transfers affect tax reminders for other clients, they’ll be recalculated and updated when the tax return is approved. Xero Tax will automatically generate and attach the correctly worded correspondence to the return for all the transfers you’ve entered. It will include the effective date you want the transfer to be processed if you’ve chosen to state this explicitly. 3 – Reconciling transfers is easier than ever. If a transfer is not completely processed by the IRD for any reason, you can now mark it as complete from any of the three screens that show pending transfers. You can now also click through to the statement or tax return the transfer was coming from and the one it was going to. This will make it much easier to double check the details before marking the transfer as complete. In addition, we’ve changed the way we show pending transfers in the payment summary on the tax return. If an inbound transfer has been partially or fully completed, we’ll only show the remaining amount on the transfer row of the summary. The actual transferred amount will continue to be included in the payments row. This solves the issue you’ve had in the past with transfers doubling up when a return is reprinted some time after the transfers have been processed by the IRD. For more details on how to use this great new feature please see the help centre. The post Introducing Multiple Refund Transfers for NZ Tax appeared first on Xero Blog. With less than three months to go till our next Xerocon in Melbourne, we chatted to some of last year’s attendees from Asia to find out what they took away from the last event, and what they’re looking forward to at this year’s Xerocon in Melbourne. Xerocon Melbourne will take place on 13 and 14 September. We’re looking forward to welcoming thousands of our accounting, bookkeeping and app partners, as well as listening to some amazing speakers from around the world. Take advantage of our early-bird pricing and get 20% off until 30 June – get your tickets here! 1. Did Xerocon give you insights that have helped you run your practice? ML: Yes. This industry is changing very fast and we can’t always predict what developments lie ahead. Xerocon is an opportunity to be open-minded, and speak to other Xero advisors and partners to equip ourselves for whatever the future holds. EL: Xerocon invites a myriad of speakers and experts in various industries from AI to successful cloud accountants. Last year’s speakers opened my mind and brought me up to speed on the latest technologies, industry and even how to grow my practice. 2. Did Xerocon give you new networking opportunities? PG: It’s always great to meet other accounting firms from around the region and we’ve built lasting partnerships with people we met at last year’s event. We even hired an Australian accountant we met last year, and he moved to Hong Kong from Melbourne to join our team! ML: We don’t have a lot of cloud accounting experts in Hong Kong, and that’s where the treasure lies at Xerocon. It’s always great to hear from Xero gurus about their experiences. 3. A big part of the Xero platform is our ecosystem. Was it useful chatting to our add-on partners? JF: I spent a lot of time with the ecosystem partners. It’s a useful way to find new solutions I can offer my clients. SS: Certainly. We met with a few add-on providers last year, and are now proud users of their apps! PG: Singapore and Hong Kong can sometimes be overlooked as key markets in our industry, so it was great to spend time with existing add-on partners and meet new ones face-to-face. There are 500,000 businesses across these two Asian cities alone with English as a primary language and the event was a great opportunity to highlight the strategic opportunities in the region. 4. Did you have an opportunity to swap tips and ideas with advisors from other regions? SS: We did, and we even learned about a new trend in bookkeeping which inspired us to create a new service for our clients called ‘lifestyle bookkeeper’. JF: Australia and New Zealand are developed markets, so there was a lot to learn from accountants there about the sophisticated services they’re offering. 5. Do you think Xerocon gives you a competitive edge in your home market? EL: At Xerocon, I got the scoop on new add-ons, features and insights into the direction the industry is heading. Based on this, we were able to adjust our practice quickly to be ahead of the curve. SS: Xerocon opens up an opportunity to learn about and adopt new technologies and automation that we never would have thought were possible. Just by using Xero we’re ahead of the curve! It’s important to learn not just about Xero updates but trends in the community. The post Xerocon Melbourne 2017: Why last year’s attendees will be joining us again appeared first on Xero Blog. Anyone who thinks bookkeeping is boring needs to meet Jules Hardie. With a shock of blonde hair, bright green eyes, and infectious energy, she’s a world away from the typical stereotype of a bean-counter. She lives and works from her home office on Bribie Island in Queensland. She is passionate about keeping her clients’ finances as fit as she is. For Jules, investing time in high intensity training gives her professional performance a real boost. So, we caught up with her to discuss the benefits of finding a good work-life balance. Why do you crunch numbers full-time rather than abs? I started my professional life in an accounting firm before working with my partner Chris running the finances for our own companies. In between running four successful small businesses, I also spent five years at a major financial institution. However, we both realised that work was dominating life and was leaving us little time to do the fitness training that we loved, so we agreed to make a change. Today, I go to the gym five days a week and manage the books for my clients, so I get the best of both worlds! How did you manage to achieve such a great balance? We wanted a new career that combined my nous for numbers and our small business expertise, so we opened our own First Class Accounts franchise in 2006. The company culture really encourages healthy work-life balance. We also saw the potential cloud accounting offered to work more efficiently and remotely. 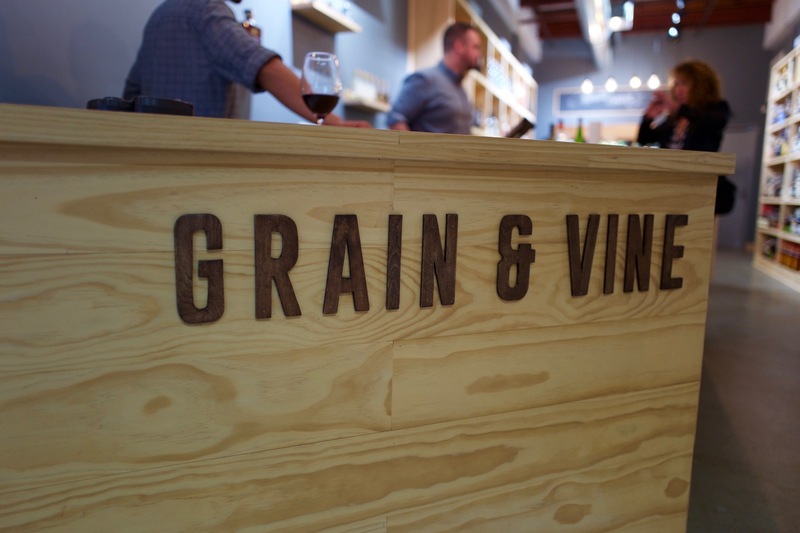 While the first few years establishing our business was hard, it’s now in great shape. 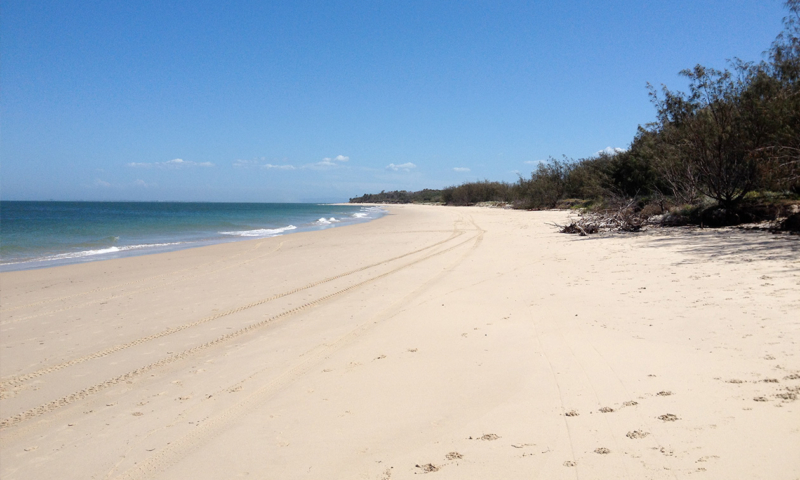 We’re now balancing the books from our Bribie Island home in Queensland. Tropical island bliss and BAS returns. How does that work? Well, we were servicing most of our clients remotely from a home office in northern New South Wales before we moved to Bribie Island, so we figured there was nothing to hold us back. Most of our clients work online so they were fine with our decision. Also the infrequent commute to those who need us to work onsite is easy. All of this means we have more time to hit the gym! We’re talking pretty intense exercise, right? Tell us what you love about it. I love training hard. I recently signed up to a ‘Fitter, Faster, Stronger Challenge’ at my local gym and came top in my club category. It’s a 12-week program designed to push you to the limit. It involves three high-intensity workouts a week that target different aspects of fitness, each of which you get scored on. While other competitors were stronger than me, I excelled in the faster and fitter areas of the program. So, what I lost at the bench press, I made up for in lightning speed burpees. I deliberately chose the toughest personal trainer because I was determined to win. Does this competitive streak run over into your bookkeeping business? Absolutely! If new leads come through, I really want to win them as clients. I have that hunger and drive to show them the value I could bring to their business, and how my service and expertise outperforms the competition. Do you think your passion for fitness benefits you as a bookkeeper? When I’m in the zone, I can feel my energy and focus levels increase. That’s really important for maintaining the discipline and motivation needed to run your own business. Bookkeeping is also a notoriously sedentary profession, so I prioritise doing something very active to keep myself in good mental and physical shape. For me, when my mind and body are in peak condition, it reflects in my performance and allows me to give my clients 100 per cent. Do your clients ever ask you for tips? Running a successful bookkeeping business isn’t all about reconciliations and receivables, it’s about building friendship and trust with your clients. And because most people want to improve their financial and personal fitness it means that we can establish great rapport. Many of them are as interested in my next crazy fitness challenge as they are my advice on how to grow their business. Should all bookkeepers have an outside interest? Regardless of your nine-to-five, I think everyone should do something they love after hours. It’s what keeps the fire in your belly burning, and taking time to live life will only inspire your work. Jules Hardie is a First Class Accounts bookkeeper who prides herself on building long-term relationships with clients and providing financial management solutions that hit the mark every time. 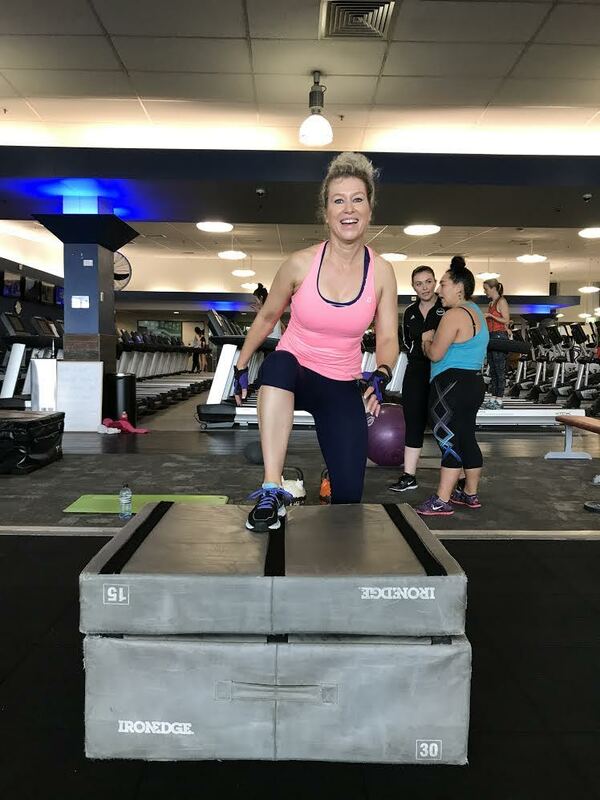 The post Secret life of bookkeepers | Jules Hardie: a fitness fanatic who lives on a tropical island appeared first on Xero Blog. With Xerocon Melbourne fast approaching, the opportunity to grab an earlybird discount will soon pass you by. And if you’re thinking, ‘I’ve already been to an accounting conference before’, think again. From live DJ sets to dresses made from money, things are done differently at Xerocon – as Sally Hams, the managing director of Xero silver partner firm, Balance Books, explains. “This will be my third year at Xerocon,” says Sally, whose cloud-based firm is based in Adelaide. “I feel excited just thinking about last year: the darkness, the blue lights, the live DJ. There was just something in the air – you knew something special was about to happen. “You have the front runners in cloud accounting sharing mind-blowing information – with data capabilities that only get bigger each year,” she adds. “For me, public speaking is about how you make someone feel when you leave the room. And that’s what I remember from Xerocon – everyone on stage gave me such a buzz. 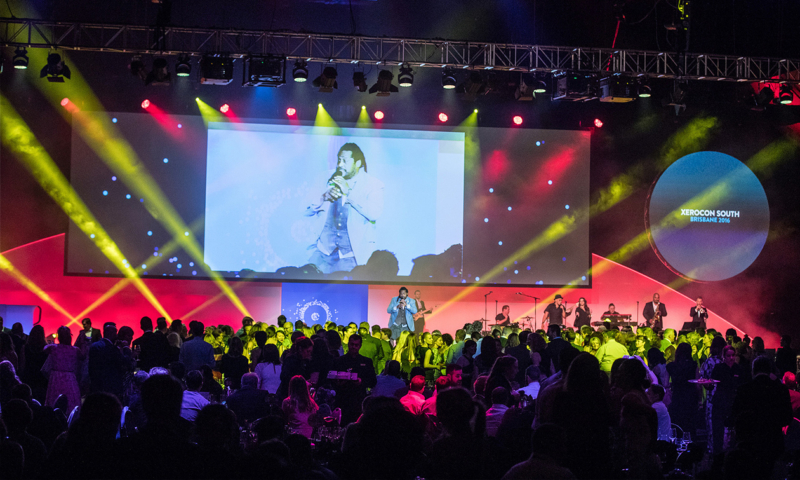 But some of the quirkiest surprises of Xerocon is left till last – once the lights go down on the main stage – and hundreds Xeros, accountants and bookkeepers return for the night’s evening entertainment. 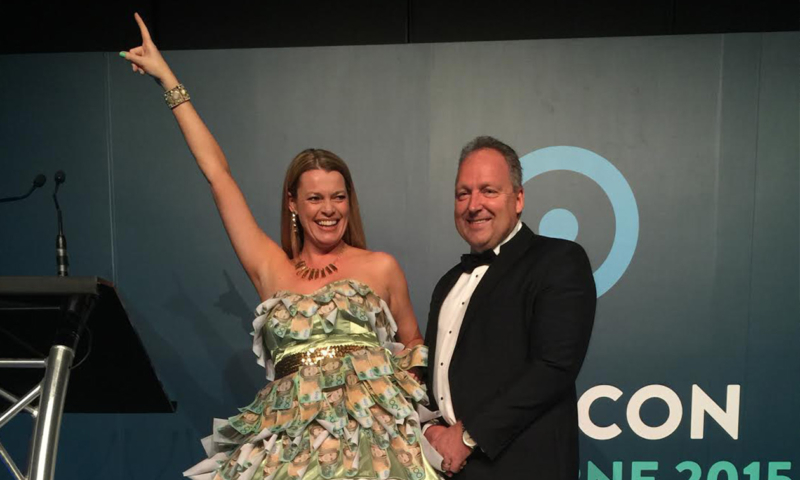 That’s where Sally secured her place as the unofficial fashion icon of Xerocon in 2015 – arriving at the award ceremony in a custom-designed gala gown made from money. In 2016 – with haute couture expectations running high – Sally didn’t disappoint. 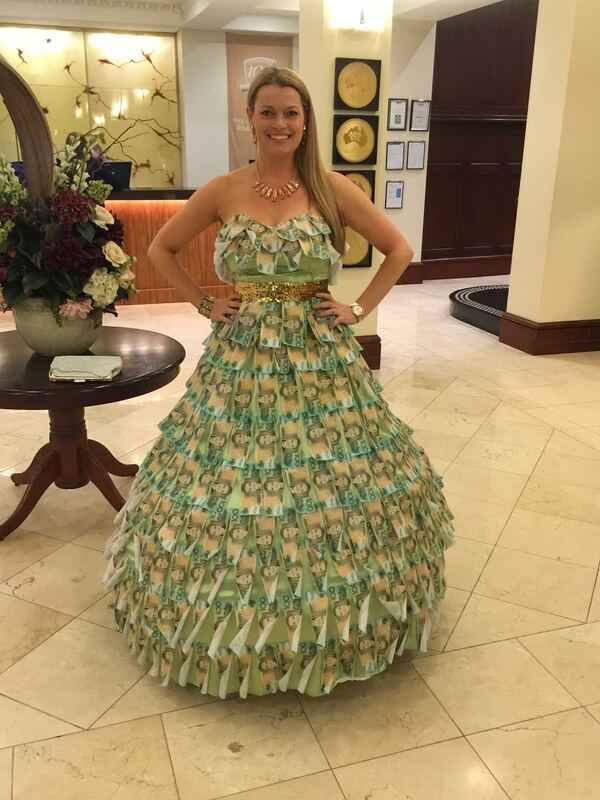 She took things digital and wore a cloud-shaped dress, complete with Xero-branded ribbon. “This year’s dress? Oh yes, I have the design,” Sally laughs. “I’m desperately hunting for someone to make it for me in time. I won’t share all the details, but I will say it involves steel. It’s a sophisticated concept, though – no spinning clouds this time. I don’t think people knew what to do with them! “It’s head-turning – but that’s the way these dresses are meant to be. Because why not do something to stand out? And this year, Sally hopes her latest design will clock up some dollar figures for a different cause. “I’m the South Australia coordinator for Share the Dignity, which helps people who suffer from domestic violence. In particular, it supplies sanitary items for homeless women, which can otherwise be too expensive,” she explains. “I’d just love for people to donate toward my 2017 dress – because all money will go to Share the Dignity. Know what you’re looking for: I let my clients know I’m off to Xerocon in advance, so I can look out for answers to their problems. Don’t fear forced friendships: I always like to build relationships with trust and integrity and, at Xerocon, you’re part of one big family. Don’t hold back. Remember we all share the same passion for the connectivity, efficiency and support that Xero provides. Engage with the online communities: Get on the Xero Facebook user groups now so you can talk to people you’ll meet in person. I love running up to a person and saying, ‘You’re real!’, or finding out how someone’s business has progressed since last year. Share what you learn: I’ll be shouting about everything I learn at Xerocon from the rooftops. Think about doing a Facebook Live video for your clients, or keep them updated with regular social media updates and email round-ups. If you’d like to donate and support Share the Dignity you can donate through Paypal or alternatively via Benojo. The post Head-to-toe in Xero: Doing things differently at Xerocon Melbourne appeared first on Xero Blog.